Pour the oil into a large pot or Dutch oven (I used a Dutch oven) and set the heat to medium. Once the oil’s hot, toss in the onion and cook for 7 minutes or until the onion looks golden brown, stirring frequently. Now add in the bacon, continuing to stir frequently for 10 minutes or until the fat has rendered. 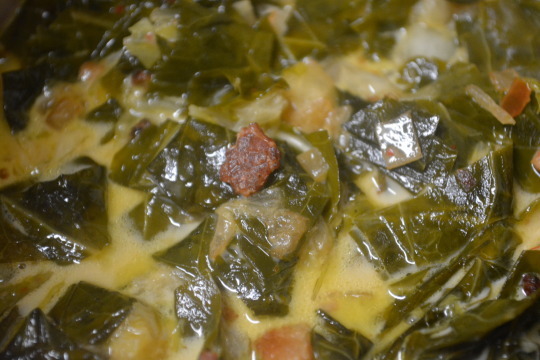 Place the collard greens in the Dutch oven now, turning the heat up to medium-high afterwards. Stir the collards constantly for 4 minutes or until they look like they’re beginning to wilt. Pour the vinegar in and let it boil for 1 minute before mixing in the stock, water, syrup, crushed red pepper and a large pinch of salt. Put the lid on the Dutch oven and let it cook for 1 ½ hour or until the collard greens are very tender, stirring now and then during that time (for me, the greens didn’t take nearly that amount of time to get tender). 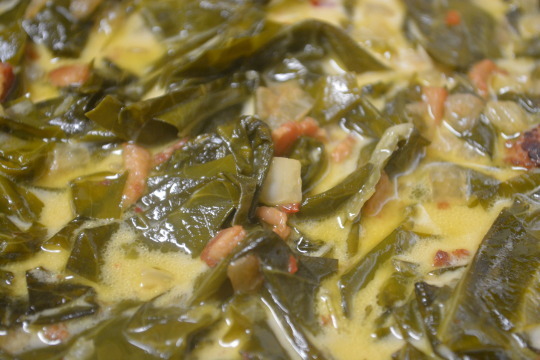 While the collard greens are cooking, take a small saucepan out and pour the cream into it, setting the heat to medium. Let the cream cook for 10 minutes or until it’s reduced down by about one-third. Add the kimchi in, stirring just to combine and then take it off the heat. Once the collard greens are tender, mix in the kimchi cream and season with salt if you think it needs any extra. We love kimchi and we love collard greens so we had to try this out. We’re glad we did ‘cause we couldn’t stop eating this, it tasted that good ! The bacon adds a little bit of smokiness and has a little bit of crispy-chewiness that adds texture to the dish. The flavor of the kimchi does come through a little, adding a little funkiness (in a good way) to the dish and of course there’s a silky creaminess in the food thanks to the heavy cream.